One of the distinctive characteristics of the Eastern European transition process is that GDP has behaved like a “V” since the beginning of the reform process.1 This peculiar behavior reflects the fall in production experienced during the first years of transition, followed by a recovery that seems to be permanent. Although it is impossible to talk about a real process of reforms in Cuba, the island seems to have left behind one of the worst economic crisis of its entire history. Even though production in some sectors has not yet reached the levels of the last decade, GDP has grown continuously for the last six years and there is no evidence that Cuba is on the eve of a new economic crisis. The Cuban political system has resisted the winds of democratic change coming from Eastern Europe and elsewhere. After the end of the socialist systems in Europe and the disintegration of the Soviet Union, the perception that the end of the Cuban regime was near gained many followers. The arguments were strong: without Soviet support, Cuba’s economy would become paralyzed and an economic crisis would provoke the fall of the regime. Few people predicted that Cuban socialism could confront the new challenge. It is important to note that, although the political situation in Cuba is linked to the state of the economy, the two must be seen through different lenses. We believe it is incorrect to assert that a new economic crisis is a necessary condition for political change. To begin with, there are no indications that a new economic crisis is in the making. In addition, there are only two foreseeable reasons for one to occur: (1) an exogenous shock affecting exchange rates, which is presently unlikely because tourism has replaced the sugar industry as the main sector of Cuba’s economy; or (2) a serious political crisis provoking a plummeting of the economy, in which case, political factors would be the cause, not the consequence, of the economic downfall. Notwithstanding recent improvements in the reporting of statistics on the Cuban economy — due to the efforts of nongovermental institutions, Cuban economists living abroad and even economists in the island — the results presented in this paper should be taken with caution. Most of the statistics and index numbers on Cuba’s economy have been developed on the basis of distorted information and using different methodologies than those common to market economies. Additionally, the lack of transparency permeating Cuban society negatively influences the results of our work. The paper is structured as follows. 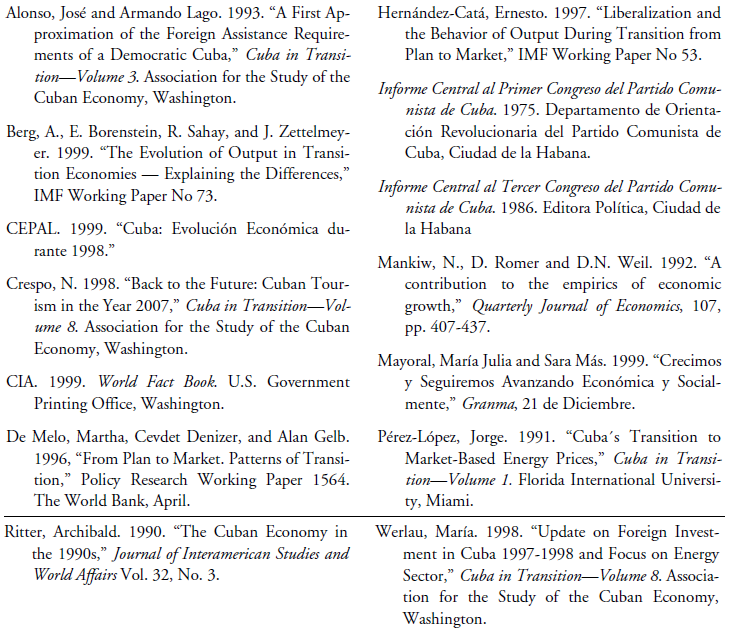 In the first section we briefly review the main features of the Cuban economy during the years of close economic relations with the Soviet Union. In the second section we analyze the transformation of the Cuban economy after the disintegration of the European socialist system. The third section examines factors that could inhibit the medium and long term growth of Cuba’s economy. In the final section, we present conclusions. During the socialist stage, the Cuban economy had specific characteristics. In addition to elements common to any socialist economy, Cuba’s economic system was characterized by a unique dependence on subsidies and other concessions from Soviet Union. Therefore, in addition to the typical distortions of socialist economies, Cuba also had those inherent to the nature of its commercial and financial relations with the former socialist community. This matter would be even more complicated if any attempt were made to compute the dynamic benefits to Cuba stemming from its relations with the Soviet Union. This is a very important point, because Soviet subsidies were mainly channeled through higher prices that the Soviet Union paid for Cuban sugar and the favorable conditions under which Cuba bought Soviet oil. Yet, it is often forgotten that Cuba’s dependence on the Soviet Union fostered the development of an inefficient industrial sector in the island with very high oil consumption. Additionally, the advantageous trading relationship provided by the Soviet Union discouraged Cuba from developing new sources of convertible foreign exchange, consequently damaging the export sector. Moreover, a substantial share of Soviet loans was employed in monumental investment projects that, although useful in inflating national statistics, implied the use of human and material resources in projects whose contribution to welfare was insignificant. Notwithstanding the sporadic complaints of Cuban leaders regarding the poor quality of Soviet products, without Soviet support Cuba’s current political system would not have been consolidated. Trade with the Soviet Union was a necessary condition for guaranteeing minimum consumption levels to every Cuban citizen as well as to delivering education and health, which were key to preserving the political system. Economic links with the Soviet Union conditioned the behavior of Cuba’s economy on imports of Soviet oil for about 30 years.3 Moreover, Soviet oil became one of the main Cuban export items by the end of 1980s, with exports of over three million tons in some years.4 Such an injection of foreign exchange provided a life line to an economy that suffered a serious shortage of foreign exchange. Ironically, Cuba became an exporter of oil and an importer of sugar. As was the case with most socialist countries, Cuban policymakers adopted as economic objective the maximization of production volumes — in physical terms as well as in value — that were determined in bureaucratic offices under premises completely divorced from the market. The Soviet oil supply was the guarantor for achieving the goals in the country’s economic plans. Trade with the Soviet Union also gave Cuba the possibility to obtain technology, intermediate inputs and replacement parts. Nonetheless, as demonstrated during the crisis of the 1990s, for 30 years investment in Cuba failed to create a national industrial plant with a low import coefficient.5 Sugar production, which demanded considerable amounts of oil, remained the main source of foreign exchange, a fact unambiguously indicating that the monoproduction problem had not been eliminated. Because Cuba continued depending significantly on Soviet imports, an important share of economic activity consisted of distributing intermediate inputs and final goods bought from the Soviet Union. The role of Soviet oil in the Cuban economy largely explains the decline in production at the beginning of the 1990s (Figure 1). The production-oil relation could also be used to estimate the real fall in Gross Domestic Product. In recent investigations of the evolution of output in Eastern Europe, analysts have used electric power generation as a proxy to estimate GDP. In the case of Cuba, from our point of view, oil consumption or even oil imports should be used instead as a proxy for domestic output.6 We find three reasons to justify this: (1) the lower participation of the industrial sector in the economy in comparison with other former socialist countries; (2) the high level of oil consumption in non-industrial sectors of Cuba’s economy; and (3) the existence of an informal sector whose main activity was not production, but the redistribution of imported final goods illegally taken from state enterprises. Taking into account the high correlation between imports of Soviet oil and Gross Domestic Product, it is more plausible to assume that the real fall in output was larger than reported in CEPAL statistics.7 Thus, while according to CEPAL and Cuban official statistics, Cuban GDP in 1993 represented 65% of the level achieved in 1989, we believe that, because oil consumption dropped by 47%, a reduction in GDP of the order of 47% makes more sense. This figure is supported by the dramatic lack of consumption goods and the monumental increases in black market prices experienced during that period. As can be seen in Figure 2, most sectors of the economy were seriously affected by reductions in the delivery of Soviet oil. The sharp fall in economy activity was caused not only by adjustment costs in capital reallocation. Rather, the economic contraction in 1990 is substantially the direct result of the end of Soviet oil shipments and other support to Cuba and therefore, the loss of an important source of economic resources. The recovery of Cuba’s economy began in 1994. By that time, Cuban authorities were resigned to the loss of Soviet subsidies. Slowly, Cuba had been redirecting its economy to the West. Although facing strong financial restrictions, there was an advantage of doing business with new partners based on world market prices. This removed one of the traditional sources of distortions in the economy, as economic relations with former socialist partners were not based on market prices. The trauma provoked by the end of Soviet support was not overcome immediately, but it is evident since the middle of the decade that, as Cuba adapted itself to the new commercial relations, the crisis was progressively alleviated. Export sectors had the most dynamic behavior and led the recovery. The case of tourism deserves special analysis. This sector, which at the end of the 1950s was one of the most important in the economy, was ignored for nearly 25 years, mainly because tourism was considered to impose large political externalities. It was not until the mid 1980s that the Cuban government decided to revive this sector as a result of its great need for convertible foreign exchange and the troublesome signals that were already coming from the Soviet Union regarding future levels of support. One of the great advantages in the changes in Cuba’s external sector is the decrease in the probability of a negative shock affecting the economy. While the dependence on sugar exports made Cuba vulnerable to the fluctuations in the world market price for sugar, tourism provides greater protection against external shocks. Tourism is also a superior good, which means that its demand rises as incomes rise in tourist sending countries. In recent years Cuba has succeeded in increasing other exports such as nickel, tobacco, alcoholic beverages and even some medications. It is a reality that the country has a highly qualified labor force, which positively influences economic performance. Since Cuba has strengthened economic links to Western economies, many professionals have acquired knowledge and entrepreneurial skills which were out of reach when trade with the Soviet Union prevailed. Additionally, economic connections to Western economies provide a vehicle to obtain more advanced technologies than those coming from the Soviet Union. Cuba’s portfolio of exports is, thus, far from typical third-world stock, usually comprised of primary products and poorly diversified. The oil sector, however, is still the weakest aspect of Cuba’s economy. It should be expected that the rate of oil consumption to GDP would decrease as the sectoral restructuring of the economy continues. Most of the inefficient and irrational economic activity during the Soviet period was due to the use of a stock of cars and trucks with excessive oil consumption as well as to the failed attempts to create an industrial plant like that of Eastern Europe. Some sectors of the economy, such as agriculture, are still facing a critical situation. This sector began to fall into a crisis in the mid-1980s due substantially to the rectification process, designed to reduce the size of the private sector. Of course, its crisis was compounded by the end of Soviet subsidies. The creation of UBPCs — Basic Units of Cooperative Production — and the reopening of agricultural markets have not provided a definitive solution to the country’s severe agricultural problem, although they have provided needed relief for the serious shortages of food. Production levels in most agricultural sectors are still significantly below both their potential and actual production levels in the 1980s. Although the Cuban people are facing a severe nutrition problem, it can be expected that agricultural production will soon recover 1989 levels. Recent experiences in China and Vietnam have proven that communist regimes can implement some reforms in agriculture without jeopardizing their monopoly over political power. The nutrition problem has been partially attenuated by the decline in population growth.10 This is consistent with an elemental conclusion of the Solow model, corroborated by empirical studies. Population growth rate is a variable affecting stationary levels of per capita consumption. Such a problem requires that some countries assign an important amount of resources to the poorest people, who usually exhibit the highest birth rate. With respect to Cuba, the fall in the birth rate was an endogenous change provoked by the worsening of the economic situation.11 The latter is well suited for the new economic Cuban model, where the state is trying to get rid of traditional paternalism. Finally, we would like to highlight the macroeconomic stability prevailing in Cuba since the middle of 1994. Cuban authorities managed to stop the devaluation of the Cuban peso and stabilize the exchange rate. Cuban dollarization, which is an unambiguous contradiction to the classical revolutionary goal of national autonomy, has played an important role in restoring macroeconomic equilibrium. It has also facilitated joint venture investments (would Sol- Meliá accept operating in Cuban pesos?) and eliminated one of the most important segments of the black market. Moreover, the government was able to bypass additional political problems, because in 1993 almost no one respected the existing penalties for holding dollars. Because the Cuban economy is extremely open, the use of dollars promotes efficiency. It could be argued that the current dual monetary system in Cuba is not optimal, but it is far better than the distorted system of the Soviet era. Undoubtedly, the consolidation of economic links with the developed countries of Europe and Canada has invigorated the Cuban economy and made it more efficient. Especially important is the profound sectoral restructuring of the economy, which has permitted tourism to emerge as the most dynamic sector and driving force of the economy. We have seen that the evolution of economic indicators for the last five years provides no basis for anticipating an interruption of this secular expansion in the foreseeable future. The behavior of Gross Domestic Product in Cuba displays the same “V” shape found in the recent economic history of Eastern Europe countries (Figure 4). This could induce people to make a false comparison between Cuba and the former socialist countries. In fact, the Cuban case is totally different from the process undergone by Eastern European countries. The Cuban government has failed to undertake an authentic process of reforms to eliminate the excessive power held by the Cuban state. Only a few concessions have been made to the private sector and just with the intention of bypassing a political crisis. The failure of the Cuban government to promote the private sector could affect the Cuban economy in the long and in the short run. Although the economy has grown despite the current economic model, the continuing government control over tourism and foreign trade makes it likely that the economy will suffer the problems inherent to a huge public sector. The Cuban government’s commitment to retain power has led it to directly run most sectors of the economy and to impose on the private sector a heavy burden for the sole purpose of stopping its incipient development. Such an irrational policy excludes millions of people from participating fully in economic activity and obstructs the growth of the production of goods and services. The numerous restrictions faced by professionals, peasants and workers keep the income levels of these groups depressed. This affects negatively consumption levels and domestic savings. Although the lack of financial resources has not kept the economy from growing in recent years, it is obvious that it will not take long for these factors to become a serious obstacle to development and growth. It is improbable that remittances and incomes stemming from tourism will offset the lack of internally-generated financial resources. The Cuban authorities have been relying heavily on direct foreign investment and joint venture projects, but this strategy also presents inconveniences and difficulties. It should be noted that the amount of foreign investment has been lower than expected. This could be explained partially by the bureaucratic barriers and obstacles faced by foreign investors and because Cuba is still classified as a high risk country for investment. The most important impediment, however, is that no country can achieve sustainable growth without relying on an efficient financial intermediation system. Data on capital inflows to developing countries show that direct foreign investment is just a portion of the resources needed by these economies: a dynamic and strong financial system is a necessary condition to giving firms and people access to private savings. Unfortunately, reforms in the Cuban banking sector undertaken in 1997 failed to bring solutions to the financial problems of small private producers, and instead was another step in strengthening the economic power of the Cuban state. There seems to be no short run solution for the old conflict of properties seized by the Cuban government at the beginning of the Revolution. For many years, both sides have blamed each other for the persistence of this problem, but the fact remains that without a solution to this conflict, Cuba will not be able to initiate a genuine transformation. As long as the Cuban government insists on hindering the development of the private sector, there is no sense in asserting that the embargo is the source of the problems of Cuba’s economy. It is worthwhile to note the dangers of a strategy that aims to compensate for the lack of financial resources by making concessions to foreign enterprises. The resources supplied by these firms have become an important factor within the Cuban economic model, but they may complicate the solution to property restitution and private property issues. The Cuban government ritually invokes the embargo to justify its position, but it is necessary to ask: Does the embargo limit the scope that can be given to the private sector? Is the embargo a reason to tax the private sector without an economic base? After leaving behind one of the worst crisis in its history, the Cuban economy looks as if it were back on a growth path. The initial shock caused by the collapse of the socialist bloc has been almost overcome and a new economic model has allowed the economy to grow uninterruptedly during the last five years. As we have stressed, the successful shift in economic relations to Western economies has made it possible to obtain many of the resources needed by the government. The boom in tourism and other export sectors is the source of the recent growth. As long as these sectors continue to expand, the economy should grow. Notwithstanding the return of economic growth, a real process of reform and liberalization aimed at establishing an economy in which the market and private sector prevail has not occurred. Although many of the distortions of the Soviet era have been removed, the monopolistic nature of the Cuban State remains. The Marxist regime has been replaced by a new state exhibiting the features of Latin American dictatorships of the nineteenth century. If the economy remains subordinated to the political interests of the Cuban government, the expectations born with the recovery will not last long. Only a real process of reform will put Cuba definitely on the path to growth. 1. See Berg, Borenstein, Sahay and Zettelmeyer, 1999. 2. There are different estimates on the ammount of Soviet subsidies to Cuba. Alonso and Lago (1992) indicate that the figure reached 20% of Cuban GDP. According to Ritter (1990), Soviet aid represented between 26% and 37% of GDP. 3. In the official discourse of the government, Cuba was catagorized as a poor country on the basis of its lack of sources of natural energy. See Informe Central al Primer Congreso del Partido Comunista de Cuba, p. 52. 5. This difficulty was openly recognized during the Third Party Congress, held in 1986. See Informe Central al Tercer Congreso del Partido Comunista de Cuba, p. 31. 6. According to estimates by J.M. Fernández, the generation of electric energy in Cuba en 1993 represented 72% of the level reached in 1989. Thus, if one utilizes the level of electric energy generated to estimate the real fall of production in Cuba, it is highly probable that that one would incur in an underestimation. See Werlau (1998). 7. 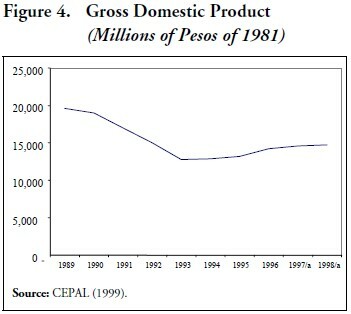 Alonso and Lago (1992) estimate that the elasticity of the consumption of petroleum with respect to GDP is 0.62. Using this estimate, the fall in GDP induced by the decline in the supply of petroleum from the USSR would be more than 47 percent. 9. See the presentation of José Luis Rodríguez at the IV Extraordinary Session of the Asamblea Nacional del Poder Popular, Granma, 21 December 1999. 11. Several factors help explain the reduction in the number of children per marriage and the decline in population growth: (1) the median level of education has increased substantially; (2) the number of marriages has probably diminished as a consequence of the housing scarcity and the additional hardships resulting from the crisis of the 1990s; (3) the legal and common practice of abortion; and (4) the high degree of incorporation of women into the labor force.